Hello all from South Carolina. I just purchased a 2016 XF 35t Prestige. White with oyster interior. The car is a CPO car with around 22k miles. I'm really enjoying the car! This is my fourth Jaguar but my first in nine years. My previous were a 2006 X-Type with Arden kit, 2001 XJR and a 1987 XJ. I loved the Arden products on my X-Type so I've ordered several aftermarket parts for the XF. My goal is to turn it into something resembling the white XF on the Arden website. 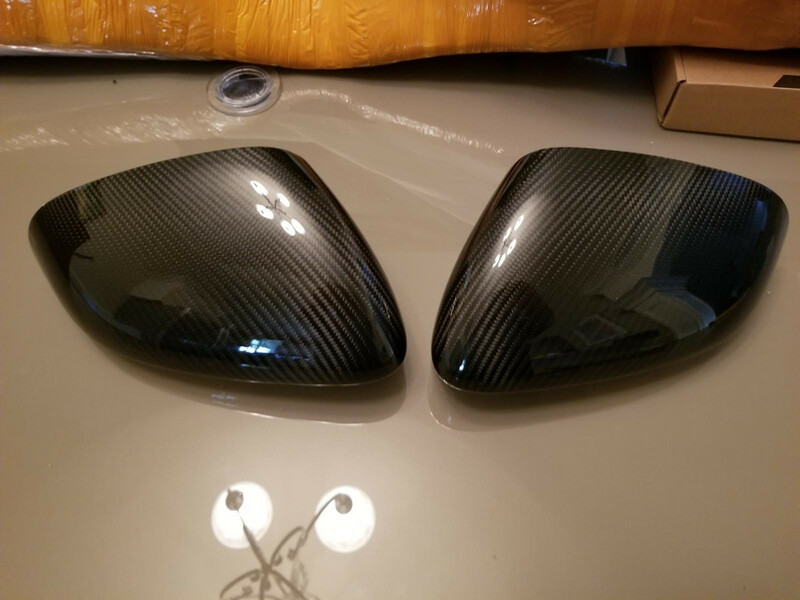 I've ordered carbon fiber spoiler, side skirts, diffuser and chin from vehicle revolution in London, carbon fiber mirror covers and power vents from a company in China, pedals and floormats from Arden, and some wheels from a US distributor. I'll post pictures once it's all done sometime in December. These forums are a great resource and I'm learning a lot. It's great to see such a supportive community. Please post pictures.....My shooting brake is factory tricked out, but would be nice to see what your dreaming up. Here are some pictures of the "before" car at home. I really like the Polaris White color (matches my SUV). I debated doing anything to the car but I've always personalized my cars in one way or another. I know there are two camps one that says don't touch the car at all as it's perfect (it is) and the other that says make it your own. I guess I fall into the later category. 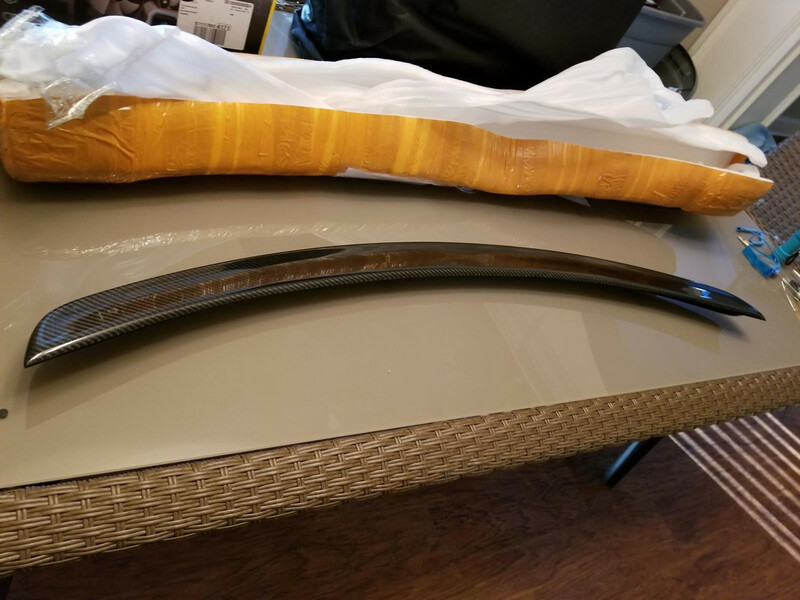 I've already received several carbon fiber parts. I'm very impressed with the finish and quality of the parts for the money. I'm waiting on the chin trim, side skirts and rear defuser from London (shoud ship next week) and the pedals and floor mats from Arden. I'm looking at the sportline light alloy wheels from the Arden site and may get those too (not the expensive 21" $1500 ones but the other 19" ones). They should fit the 245/40R 19 tires I currently have. I like the proportions of the 19" wheels on the car. I've made an appointment to get the window chrome wrapped black in a couple weeks and am debating having the horizontal chrome on the read blacked as well. What do you all think is that a good look or not? I want to leave a little chrome on the car so the grille trim and the jaguar leaper on the trunklid (with Jaguar text) will remain chrome but I'm uncertain about that horizontal trunk chrome. I'm leaning toward keeping it chrome. I plan to keep the XF as well on the trunklid but the 35t I will remove and replace with an Arden badge. I'm also wondering what to do with the chrome blades on the front bumper. Can I wrap them, plastidip, I really don't care for them. Since my car isn't an "S" model I don't have the nicer front bumper with the black blades but I like that look. Any suggestions on what to do with the blades? Once the body parts show up it'll go to a local body shop that does a lot of aftermarket stuff for installation of everything. On the interior I added a small Jaguar logo to the shift knob top and I'll add a small Arden logo to the dashboard along with the floor mats and pedal set. The tan interior doesn't lend to carbon fiber so that is about it for interior changes. I did ask Arden what they would charge to replace the black gloss "trim" with real wood but I'm guessing it's a small fortune so it'll probably stay black. 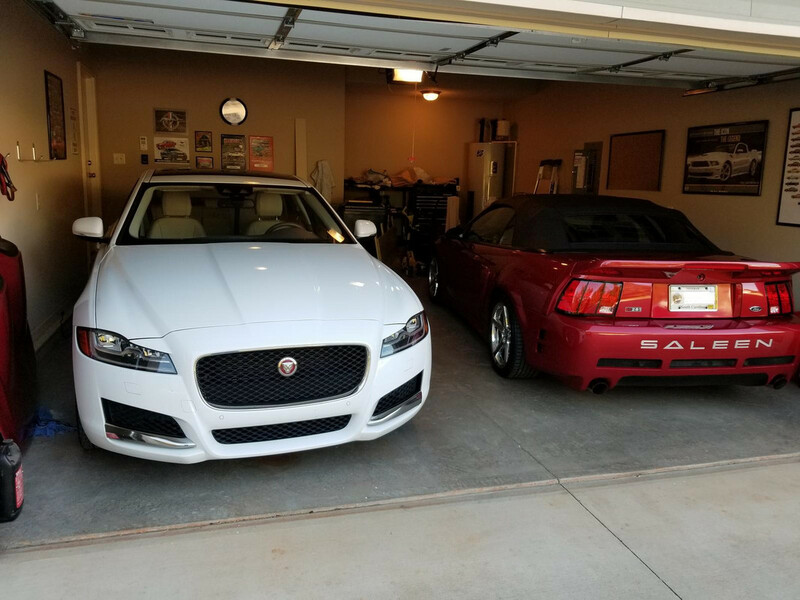 My white 2016 Jaguar XF Prestige in the driveway at home. 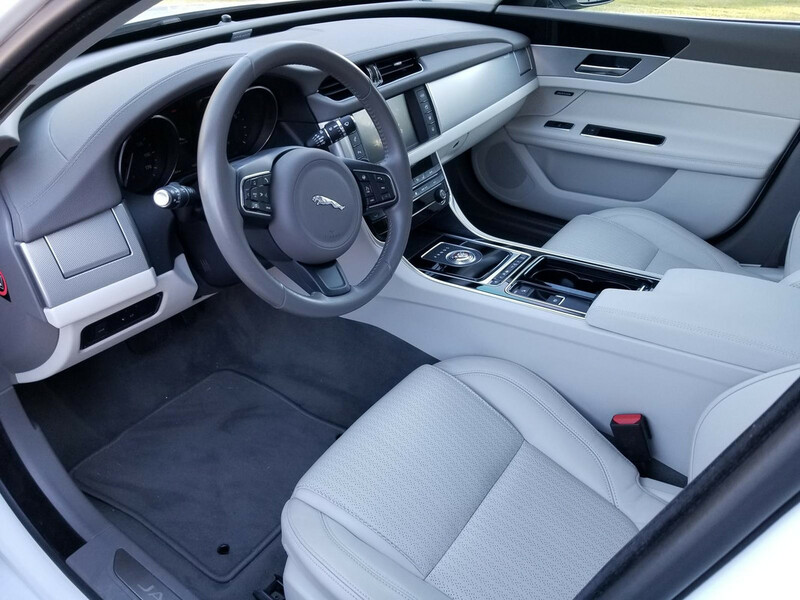 The interior is Oyster color. Sharing the garage with my Mustang. The SUV parks outside! 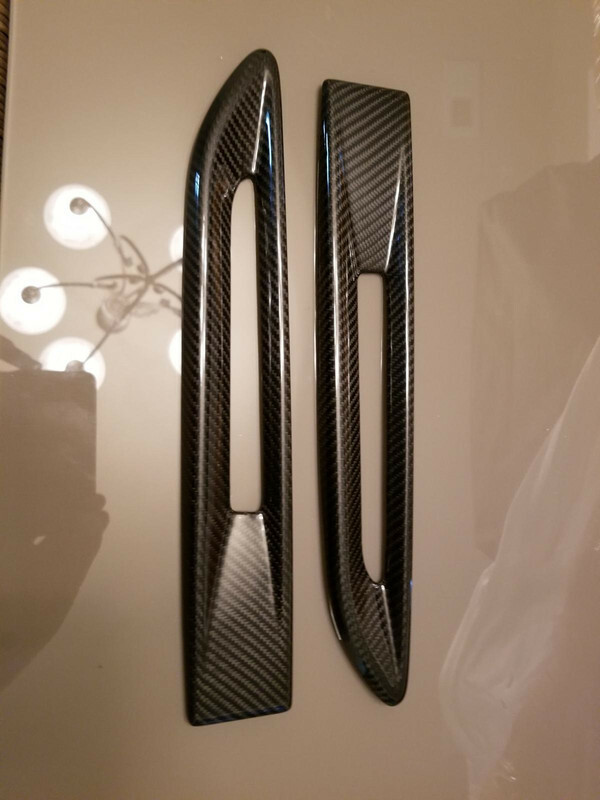 Carbon fiber side power vent covers. This is the car from the Arden website and is similar to the look I'm going for. Arden didn't come out with a body kit for the 260 model XF so I went with Vehicle Revolutions carbon fiber kit. Last edited by EKinSC; 10-21-2018 at 05:26 PM. EKinSC: Congratulations. Looks great in WHITE. I have same year and model in metallic grey with light Oyster interior. Love the car and it has already about 20K miles(35K Kms in Canada. ).